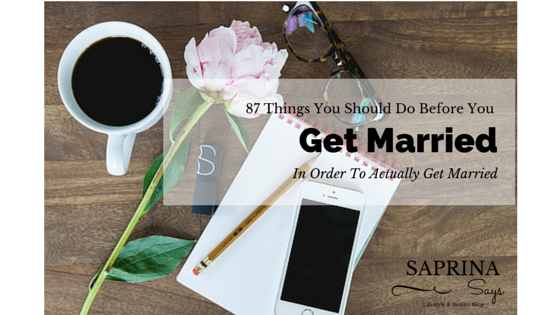 What Saprina Says: 87 Things You Should Do Before You Get Married In Order To Actually Get Married. I follow a lot of blogs on Bloglovin. Speaking of, you should probably follow mine! I follow a lot of Christian Blogs and not all of them are even for single people. So that leads me to believe we might be a little overly obsessed with the whole “marriage” topic. I’m pretty sure no matter how holy I am (or think I am) before I get married, I’ll step into that relationship and suddenly figure out there was a whole slue of crap that I have to deal with about myself. And then, adding fuel to the fire, I now have to figure out those icky things about me in the context of a relationship. Which makes things twice as messy. Then, the next thing you know I’m waking up at 4:00 am so that I can translate the whole book of Leviticus from it’s original Hebrew into Greek and then into English and then into Quechua so I can spread the gospel to the unreached people of Ecuador, all before going to my job. But then I just end up crabby, which is the opposite of holy, because while I am a morning person, 4 am is pushing it, pretty much no one likes reading the book of Leviticus and I don’t know Greek, Hebrew or Quechua. And I got God all wrong. That sounds so dumb as a write it out. Because I know it doesn’t work like that. I like to know what’s going on, and I like to have a plan. That’s probably why I still get sucked into reading those “Five Things To Do Before You Meet Your Spouse,” articles. I want to believe that if I do those 5 things, at the right time, generally at midnight the night of a full moon, my future spouse will pop out of the ground. It never works like that. Mostly, because people don’t pop out of the ground. But, actually it’s because God and I are in a continual wrestling match for who gets to be in control over my life. And, he’s also God. Yes, I did repeat myself, but the fact that he’s God means that he is inherently good, he loves me, he knows me, he cares for me, he likes me and he wants the best for me. Sounds like a great guy to give up control too. If God doesn’t forget about sparrows, he’s not going to forget about me. If he’s taking the time to count all the hairs on my head, which I don’t even have time for, then I’m pretty sure he’s going to know what’s best for my life. And today, that doesn’t include a spouse. It probably won’t include one tomorrow either. Beyond that, I don’t know, but God does. But today, I’m going to work on giving control to him. Good blog Sabrina! 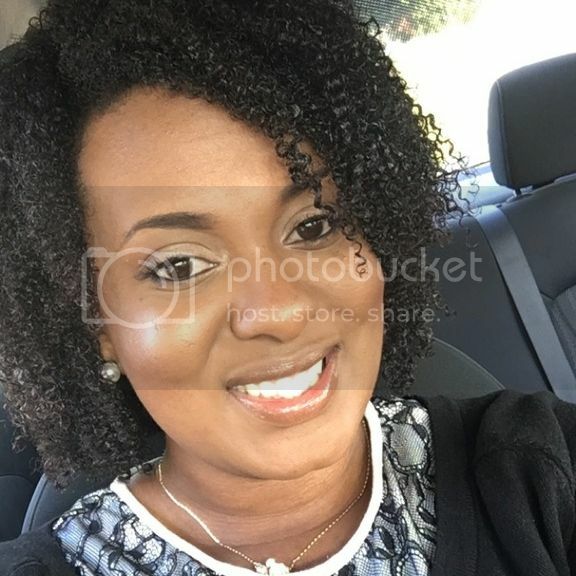 Latoya S.
This is not at all what I was expecting when I opened this post! I really enjoyed reading this. God is in control and has not forgotten about you. He will lead you to the right person at the right time! Your attitude is awesome! However, I understand how it can be terribly hard to keep up that attitude and have patience! Keep up the faith! I'm so happy that you enjoyed it! Thank you for stopping by! Great read! Very thought provoking. I'm not a christian but it's nice to hear about other's close relationship with God. My prayer for my blog has always been that all people regardless of faith could read and somehow connect to what I have to say...I'm so pleased that you enjoyed it! Great post. Not what I thought I was going to read but glad I did. Hi! I am stopping by from the High Five for Friday link-up. This post was really good! I loved reading it! You hti the nail on the head with this post. Thanks for the encouragement! Sarah thanks so much for visiting! I'm so happy you enjoyed it! Great post! I'm married and I still get sucked into reading those posts! I think we all strive to want to be doing something 'right' and 'normal' and want to make sure we are on the right track and if we aren't we want to know what we need to do to get there! Thanks for joining the Link-It To Me Link Party! I hope you will join us again this week! Really great article. I think it's so important to keep this point of view! Giving control to Him is awesome! This is a great point of view I am always reminded of that scripture.